The Blumer Farmhouse sits on a secluded 1.81-acre parcel of land at the end of a private drive, just north of Grand View. 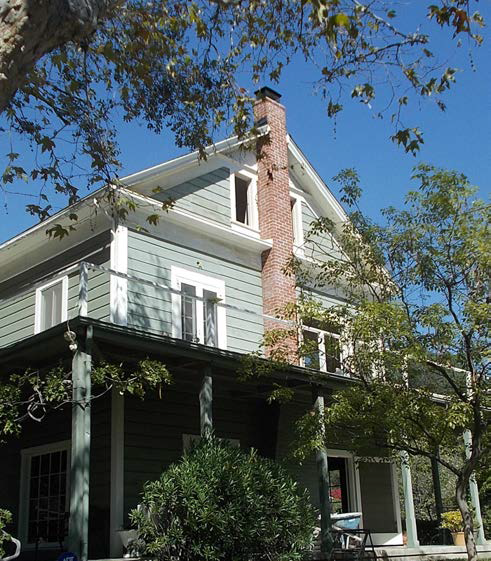 It recently became re-listed as an historic landmark in Sierra Madre and was designated as the Blumer Farmhouse. It is one of the few homes still standing pictured in the historic Bird’s Eye View of Sierra Madre, which was utilized by Nathaniel Carter, the town’s founder, as a promotional piece to entice settlers and investors to Sierra Madre. Although a 17’x34’ two-story home was built in 1883 by Amos D. Trussel, J.G. Blumer made significant changes the existing structure after purchasing the property in 1887. These included elevating the original two-story structure and adding a new first floor underneath in addition to widening the home. A covered second floor porch that wrapped around three sides of the house was also added. Blumer, a native of England, was active in local affairs and was elected mayor of Sierra Madre at the incorporation of the City in 1907. He also assisted in reorganizing the Sierra Madre Water Company that Amos Trussel had helped establish. Because of this, he was involved in the sometimes contentious water rights negotiations with “Lucky” Baldwin. Additionally, Blumer helped start the library society, and was a major contributor in the efforts to bring the Pacific Electric Railroad to Sierra Madre.